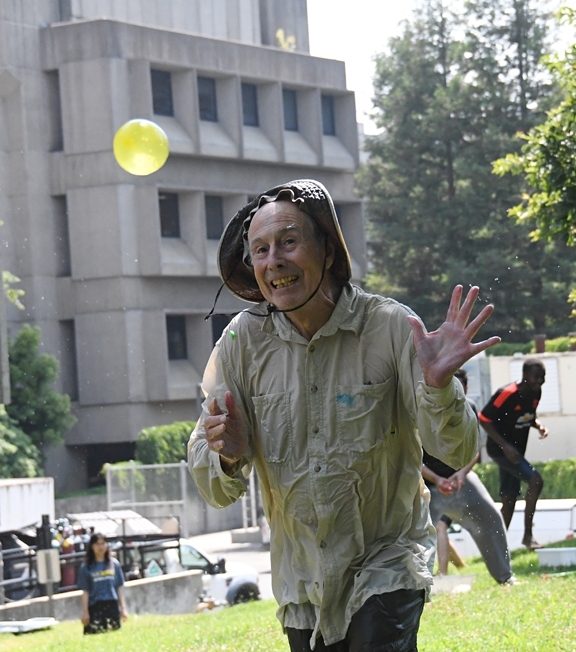 Water balloons, water guns, super sprayers, and buckets prevailed when dozens of scientists participated in the 15th annual Bruce Hammock Lab Water Balloon Battle on the Briggs Hall lawn at the University of California, Davis. The July event, also known as "Bruce's Big Balloon Battle at Briggs," proved to be an international soakfest. That's because the 28 researchers in the Hammock lab hail from seven countries: the United Stares, China, France, Ukraine, Lebanon, Japan and Korea. They include postdoctoral scholars, researchers, graduate students, visiting scholars, visiting graduate students, visiting summer students, short-term visiting scholars and student interns. The annual battle amounts to 15 minutes, or "15 Minutes of Aim." 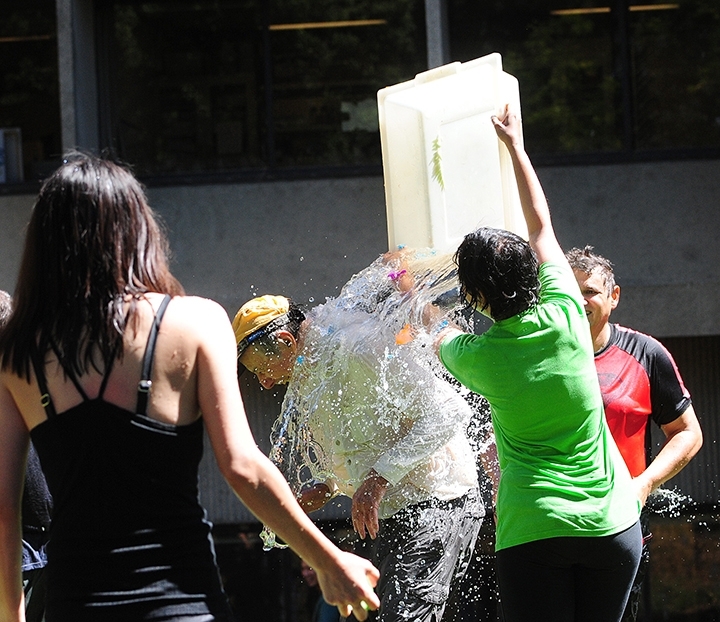 That's how long it takes for the some 40 water warriors to toss 2,000 water balloons. 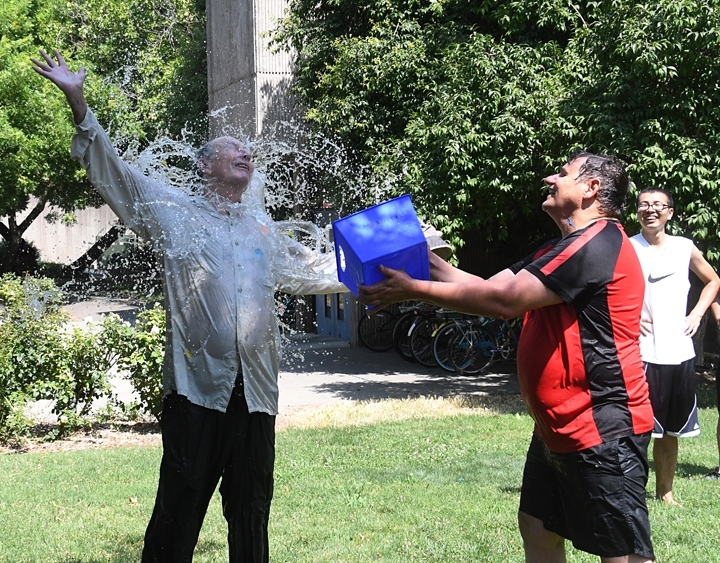 Joining in were scientists from the Aldrin Gomes lab, UC Davis Department of Neurobiology, Physiology and Behavior; Frank Zalom lab of the UC Davis Department of Entomology and Nematology; and the UC Davis Department of Mathematics, plus family and friends. 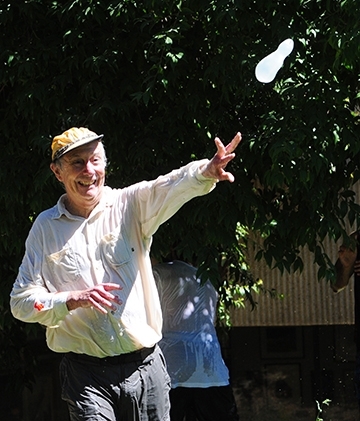 Hammock, a UC Davis distinguished professor who holds a joint appointment with the UC Davis Department of Entomology and the UC Davis Comprehensive Cancer Center, hosts the annual event in mid-July when triple-digit temperatures strike the campus. 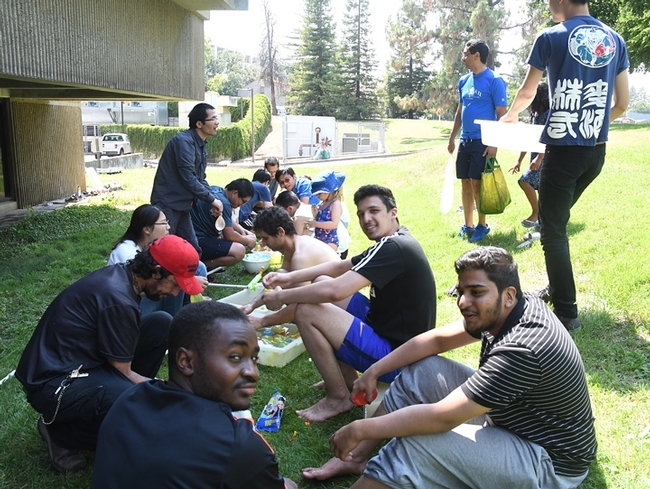 It's an opportunity for the lab members--who work hard throughout the year and play hard for 15 minutes--to engage in a little fun and camaraderie. The thirsty lawn benefits, too. First the water warriors fill the balloons in an assemblyline procedure, and at exactly 3 p.m., the soakfest begins. As the H2O dwindles, they empty buckets at unsuspecting targets. The last part: picking up every single balloon remnant from the lawn. Hammock, trained as a entomologist, chemist and toxicologist--and who now focuses his research on human health, is recognized for his work on using natural chemical mediators to control inflammation and intractable pain. He co-discovered the soluble epoxide hydrolase, and many of his more than 1100 publications and patents are on the P450 branch of the arachidonate cascade where the soluble epoxide hydrolase (sEH) degrades natural analgesic and anti-inflammatory compounds. 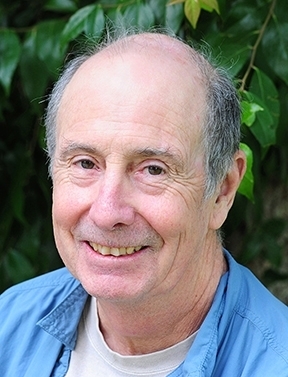 Hammock, an alumnus of UC Berkeley with a doctorate in entomology, joined the UC Davis faculty in 1980. 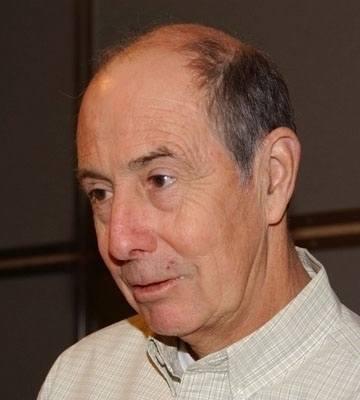 He is the founding director (1987-present) of the UC Davis NIEHS (National Institute of Environmental Health Sciences) Superfund Research Program and is a founding member (1990-present) of the UC Davis Comprehensive Cancer Center. 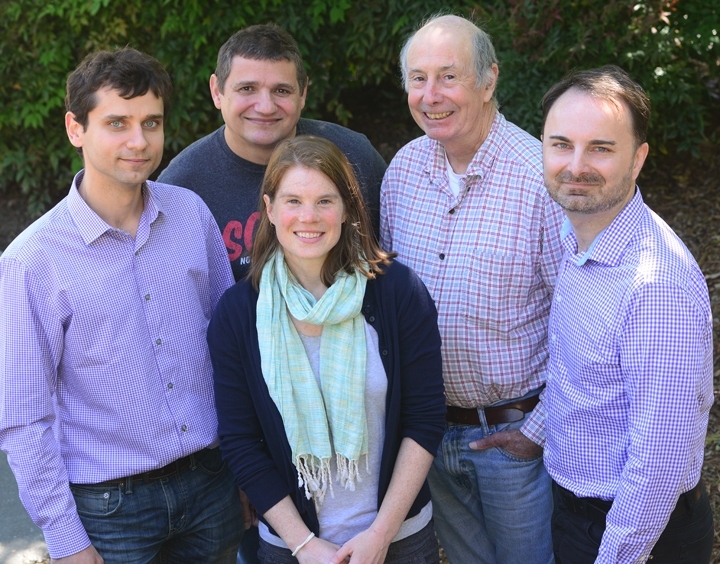 He has directed the UC Davis NIH/NIEHS Combined Analytical Laboratory for 25 years. Highly honored by his peers, Hammock is a fellow of the National Academy of Inventors, which honors academic invention and encourages translations of inventions to benefit society. He is a member of the U.S. National Academy of Sciences, a fellow of the Entomological Society of America, and the recipient of the Bernard B. Brodie Award in Drug Metabolism, sponsored by the America Society for Pharmacology and Experimental Therapeutics. 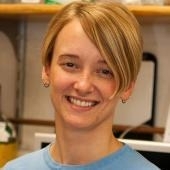 He is the first McGiff Memorial Awardee in Lipid Biochemistry. 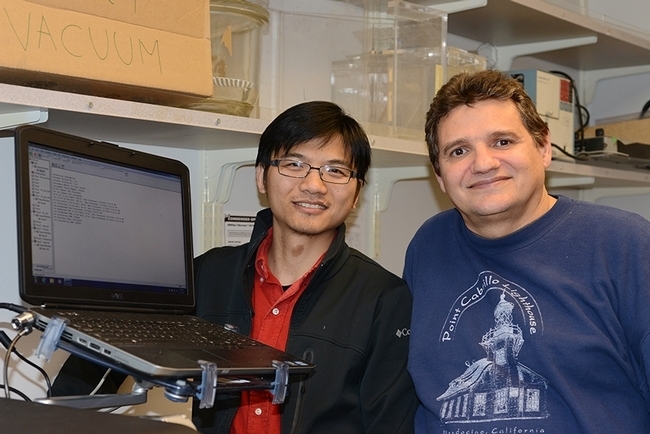 The Eicosanoid Research Foundation recently honored him for work on oxidized lipids. 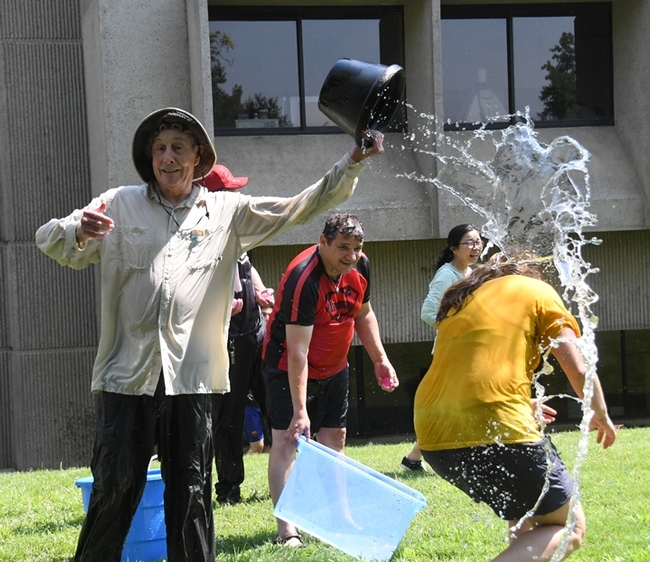 But on one day in July--for 15 minutes--noted academician Bruce Hammock leaves his Briggs Hall office and transforms into an elite water warrior. He's practiced for 15 years, 15 minutes at a time. "Bruce has a good aim," said Christophe Morisseau, a Hammock lab researcher who coordinates the annual battles. 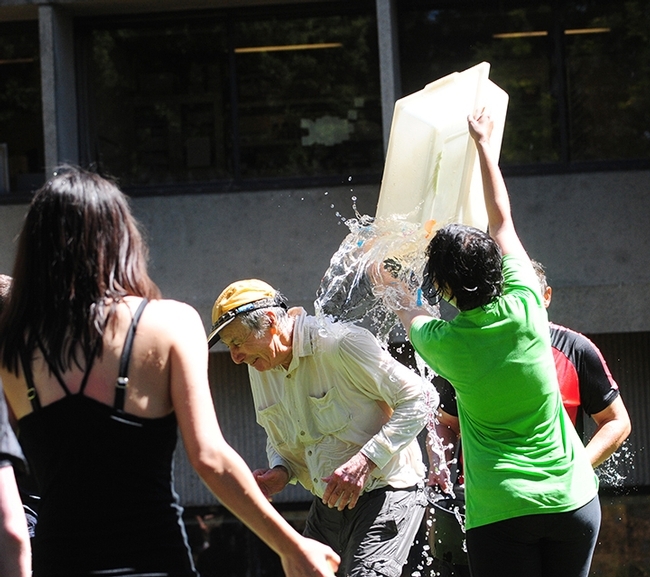 "Splash Brother" Bruce Hammock, distinguished professor of entomology, aims a water balloon. Fifteen minutes of aim, that's all it took. Water warriors Bruce Hammock, distinguished professor of entomology with a joint appointment with the UC Davis Comprehensive Cancer Center, and research scientist Christophe Morisseau of the Hammock lab proved to be “The Splash Brothers,” much like basketball superstars Steph Curry and Klay Thompson of the Golden State Warriors. But they did it with water balloons, not with a basketball. 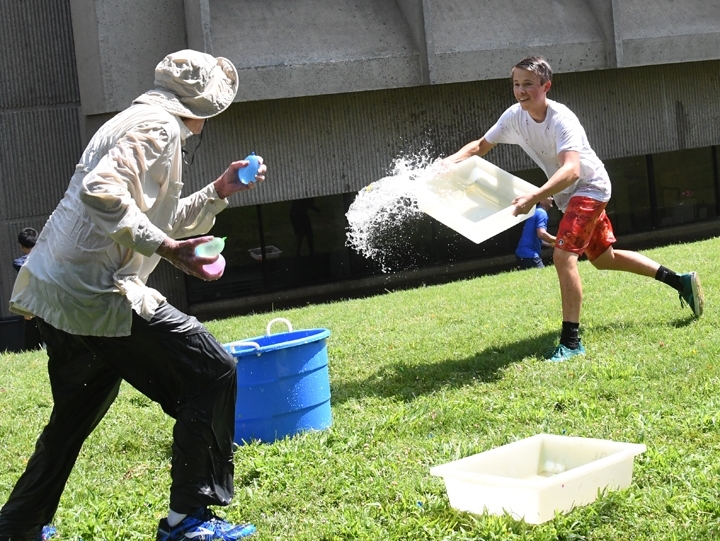 It was all part of the 13th annual Hammock Lab Water Balloon Battle, dubbed “Balloon Battle at Briggs” last Friday afternoon. 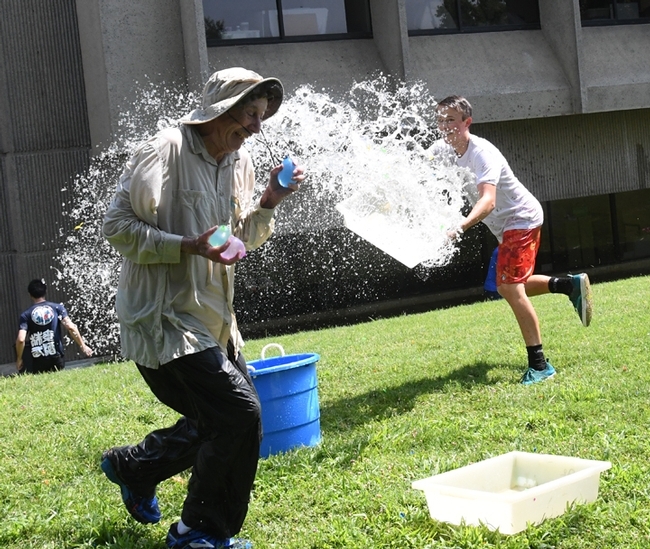 The 40 participants, including professors, researchers, graduate students, staff, students and family members, tossed 3000 water balloons in 15 minutes on the thirsty Briggs Hall lawn, as the temperature soared to 97 degrees. As the supply dwindled, they dumped the remaining water from the buckets on each other. A highlight: “Splash Sister” Alifia Merchant of the Hammock lab, who just received her master's degree in agriculture and environmental chemistry, managed to sneak up on Hammock and drench him. 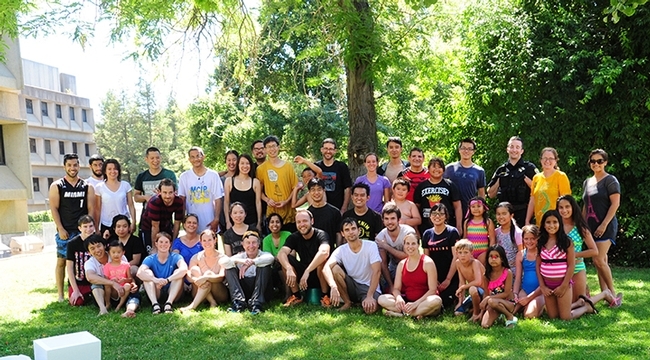 Hammock launched the annual event in 2003 as a form of camaraderie and as a means of rewarding the lab members for their hard work. The international Hammock lab includes 7 researchers, 9 postdoctorates, 3 graduate students, 10 visiting scholars, 3 staff and 1 undergrad. They represent Barbados, Canada, China, France, Germany, Hong Kong, India, Japan, Korea, Sweden, Thailand, Turkey, United States, Ukraine and Uruguay. 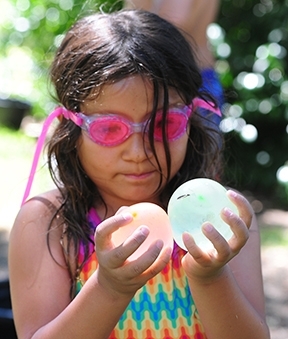 Jasmine Morisseau, 7, cradles two water balloons. She gave one to UC Davis police officer Stephen Jerguson for "safekeeping." Among those participating was Aldrin Gomes, associate professor in the Department of Physiology and Membrane Biology, and his lab. 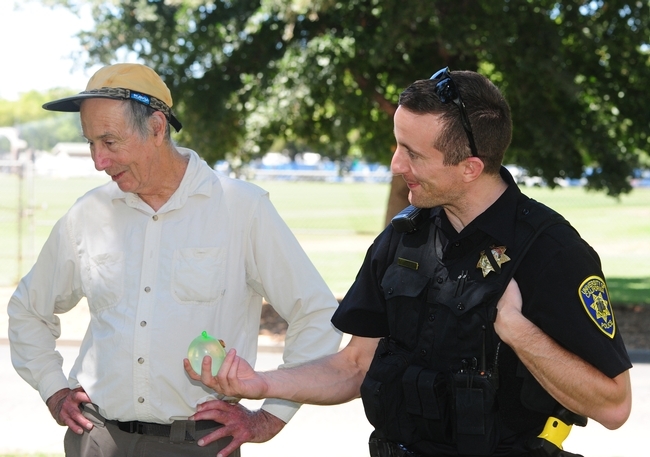 When UC Davis police officer Stephen Jerguson passed by on foot, he was invited to join in on the fun. 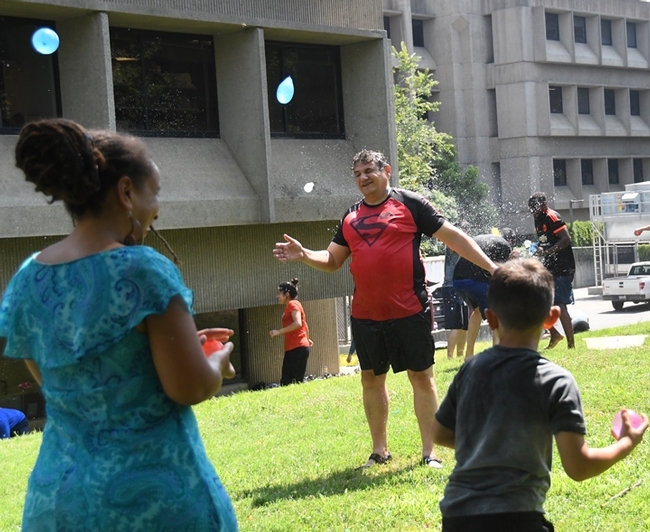 Seven-year-old Jasmine Morisseau, daughter of Christophe Morisseau, handed him a water balloon for safe-keeping as he watched the fun-in-the-sun event from the sidelines. At the end of the battle, he handed it back to her. He then joined the group in cleaning up the balloon remnants. Hammock, a member of the National Academy of Sciences and a fellow of the National Academy of Inventors, directs the campuswide Superfund Research and Training Program, an interdisciplinary program funded by the National Institute of Environmental Sciences (NIEHS) that has brought in almost $60 million to the UC Davis campus. 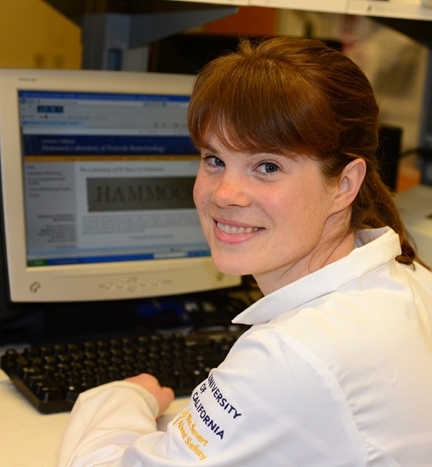 The Hammock lab is also the home of the National Institutes of Health Training Grant in Biomolecular Technology. The lab alumni, totaling more than 100 graduates, hold positions of distinction in academia, industry and government as well as more than 300 postdoctorates. The “Balloon Battle at Briggs” was canceled last year due to the severity of the California drought. 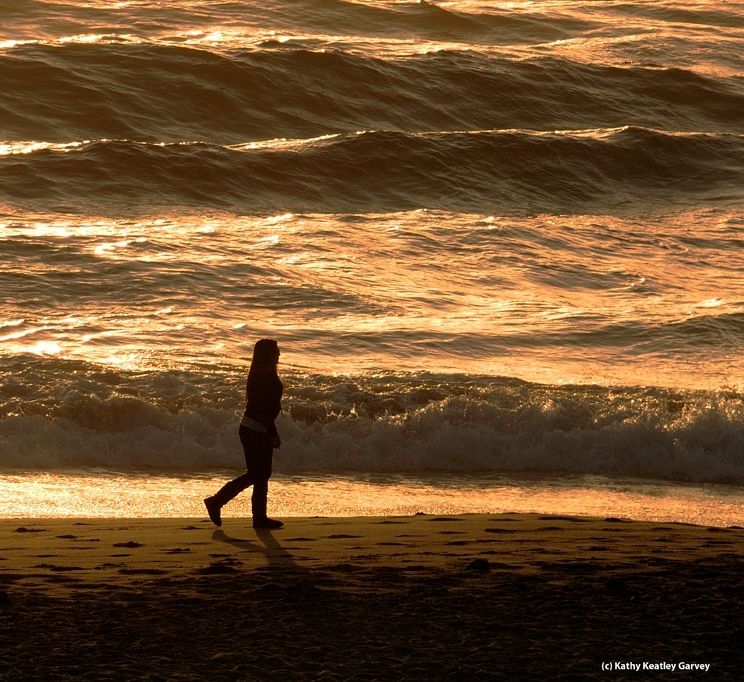 In 2014, the water warriors took drought-conservation precautions as they did this year. 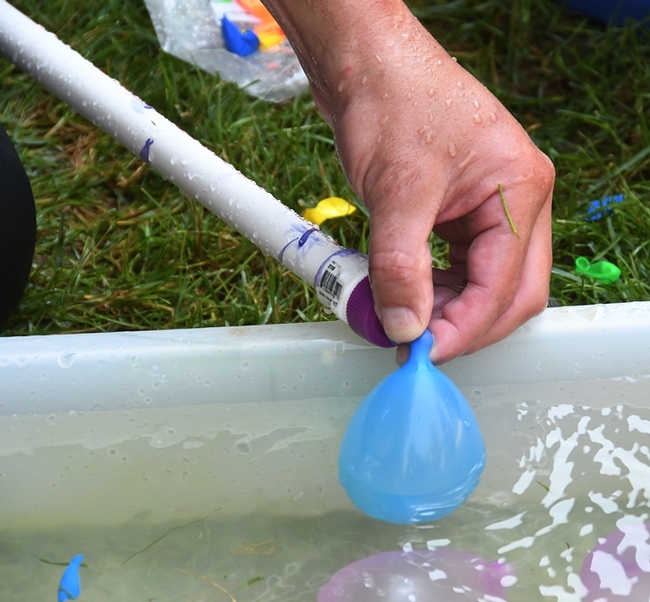 “We devised a filling station out of drip line and valves so we could fill the balloons outside and also turn off the water when not in use,” said Hammock lab program manager Cindy McReynolds. “Water conservation was a big topic surrounding the (2014) event, so we also used it as an opportunity to discuss ways we have changed our daily routines to conserve water." 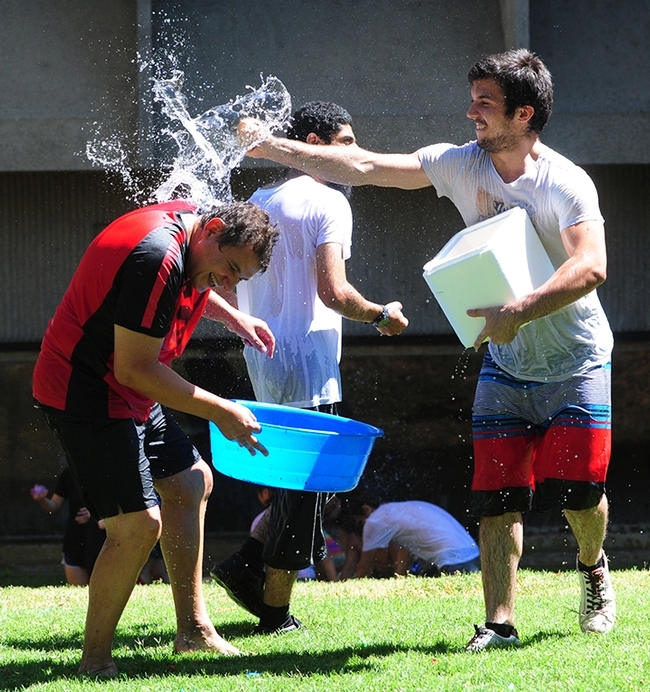 As an extra bonus, the annual battle provides a little water for the thirsty Briggs Hall lawn, which is used by campus wildlife, including ducks, turkeys, squirrels, birds, butterflies and bees. Second in series: Water cascades over Bruce Hammock, compliments of Alifia Merchant. 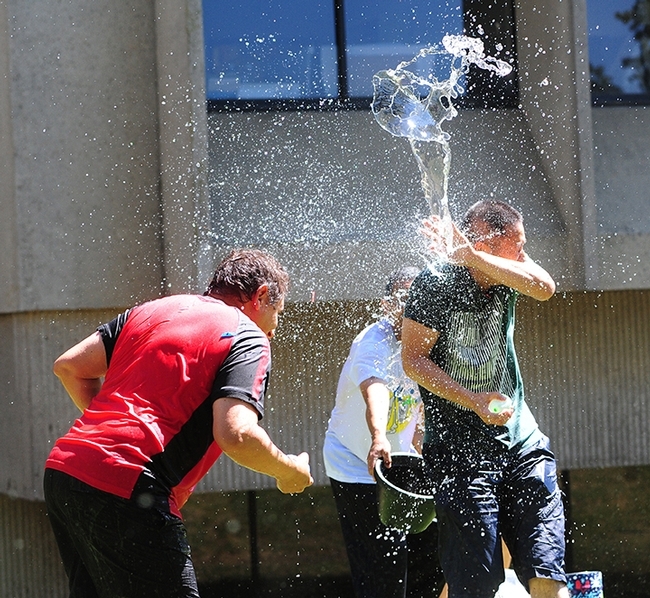 Tom Joseph, a visiting student from France (Aldrin Gomes lab) targets Christophe Morisseau of the Hammock lab. Ting Xu (far right), a visiting professor from China, gets splashed. At left is Hammock lab research scientist Christopher Morisseau. Associate professor Aldrin Gomes is in the background. Bruce Hammock ponders tips on water balloon battling as he chats with UC Davis police officer Stephen Jerguson, who was handed a water balloon for "safekeeping" by seven-year-old Jasmine Morisseau. 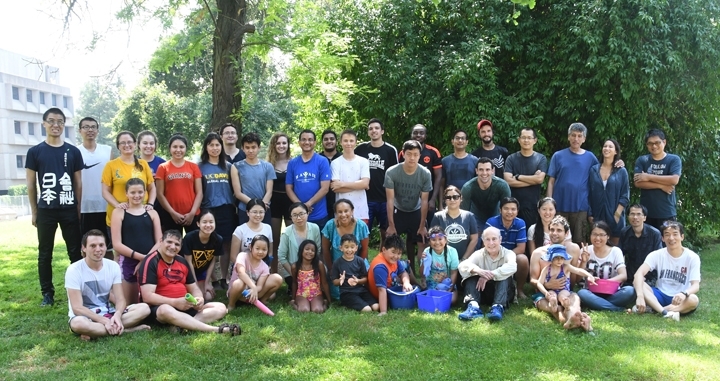 The Water Warriors pose for a group photo following the 15-minute event.